This Week at SecureIt, Ryan and Tom discuss the benefits of storing your firearms for home defense. They’ll highlight why you should store firearms throughout the home as opposed to storing them in one single location. You’ll also learn which products work best, the locations you need to consider, and why it’s a beneficial method of gun storage. Also, get an update on the Gun Storage Giveaway, the status of the TRUE safe pry-bar testing, and more. 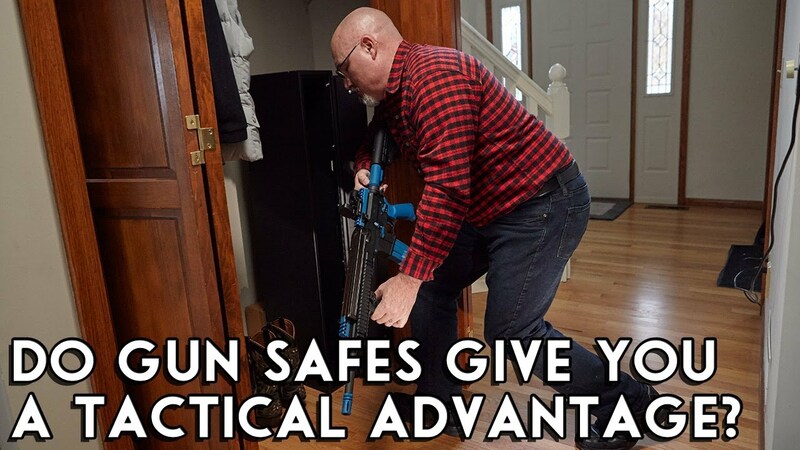 If all of your firearms are located in a safe in the basement, den, or home office and you are not in a nearby area in the event of a home invasion, you are now at a tactical disadvantage. If a thief knows you have a gun safe, they’ll be in and out of the safe in under 5 minutes. In most scenarios, the first place an intruder will go is the master bedroom. This is generally where a number of highly valuable items are stored. After that, they’ll head to an office, the living room, then the dining room or basement. However, an intruder is likely to ignore any guest rooms, the kitchen or kitchen pantry, and closets. These areas of the home are the first places that should be considered when setting up decentralized storage. The Fast Box Model 47 can be conveniently hidden under the bed by mounting to your steel bed frame. You also spend a great deal of time in this room when you are home. Having one defensive firearm located either under the bed or in the closet (Vertical Kit required for a vertical application) to maintain a tactical advantage. You can conveniently store a firearm underneath your bed by mounting a Fast Box Model 47. Typically, a spare bedroom or guest room contains nothing of great value. It’s a room for spare linens, out-of-season attire, and cleaning supplies. If your home has one, it is a room a thief will ignore. Consider storing an Agile Model 52 in a guest room and also, utilizing it as a safe meeting place if multiple people are living in the home. From a tactical standpoint, you have a greater advantage now that everyone is together and armed. Coats, boots, hats and gloves, towels, and old holiday decorations. This is what a thief will find in most closets. Someone breaking into your home is not worried about what outerwear you might have. Also, keeping a Fast Box, or an Agile Mode 52 if the space is large enough, stored in a closet near the front door is beneficial should there ever be someone at the front door who is aggressive and threatening. It is unlikely that someone is looking to raid your spice rack if they’re going to go through the trouble of breaking into your home. Pots and pans are usually not at the top of the list of things a thief is looking to steal. Much like a guest room, a thief is likely to ignore the kitchen. Also, consider that people tend to spend a lot of time in the kitchen when they are home. If your cabinets or pantry have enough space, storing a Fast Box with a Vertical Kit within the kitchen is a smart option. You’re able to keep a firearm concealed, secure, and accessible in the event of an emergency situation. Kitchens also tend to have an exit point from the home making it easier for you to arm yourself and get out of harm’s way. In the event of a home invasion, the ultimate goal should be to arm yourself and exit the home immediately. If a swift exit is not possible, arming yourself for protection of you and your loved ones is crucial. The concept of single-location storage does not afford gun owners with the ability to quickly obtain a home defense firearm. The Fast Box hidden gun storage and the Agile product line allow you to securely store firearms throughout the home and keep them hidden yet accessible. While the odds of a home invasion can be low, the cost can be high. This is why it is critical to store your firearms for a tactical advantage. I would like to see a pry test on the Model 52, to test the amount of time bought. To be realistic, the box should be mounted to the floor and wall. Most robbers likely won’t be carrying power saws or 4 foot pry bars, so the test should be with common tools a common smash & grab thief would be expected to carry.If you want to get really creative, then do two tests, one with the box mounted to a left hand corner which restricts the thief’s movements. While I know this would be no-where close to a True Safe, it would provide data which can be used when designing the rest of the security layers. Basically if I know the police response time is ‘n’ once the alarm goes off, I need to have enough barriers in place to hold up until then if I don’t want the contents of my Model 52 stolen.